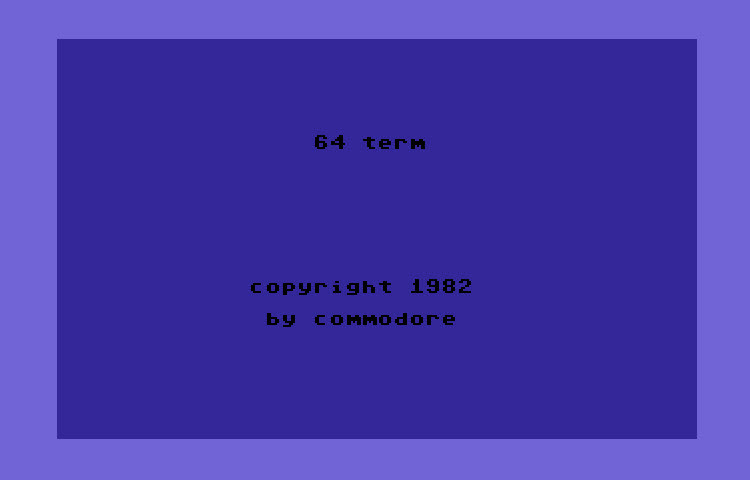 64 Term released in 1982 by Commodore. 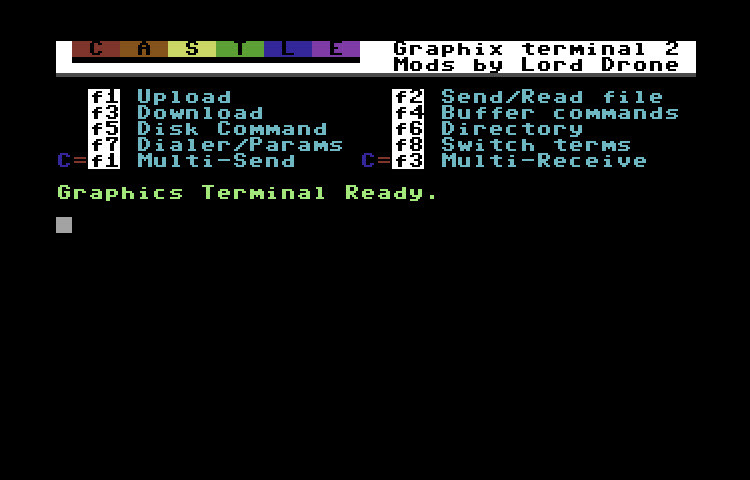 This has to be one of the earliest terminal programs I have seen for the commodore 64. It is only 11 blocks and written completely in ML. 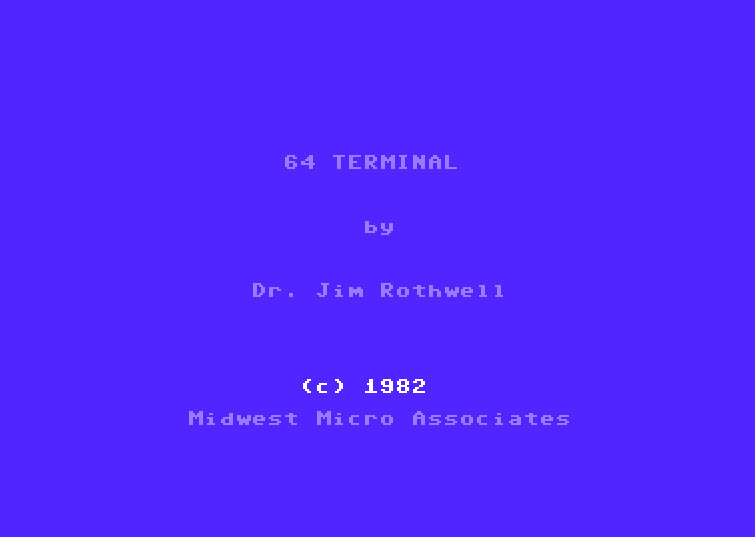 64 Terminal by Dr. Jim Rothewell released in 1982. Released in 1989 by Dane Martin. Programming by Thrasher. Animation by Espionage & Thrasher. 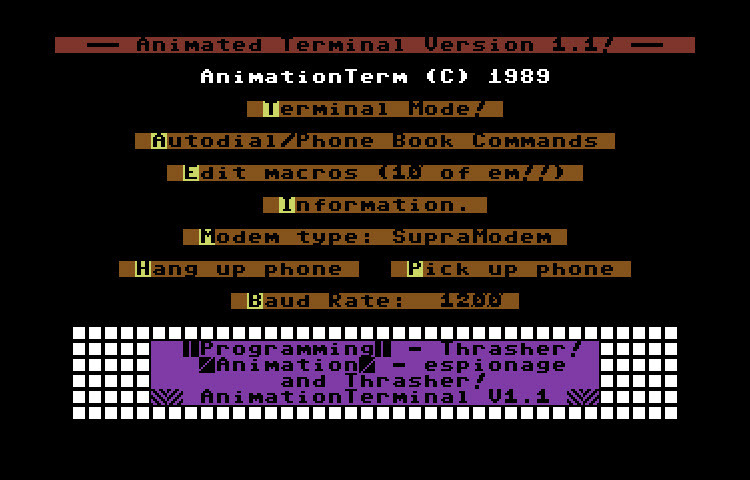 This terminal supports a special animation mode that requires the BBS your calling to support also, otherwise it reverts to normal C/G mode. By Michael Beutling - Released in 1991. 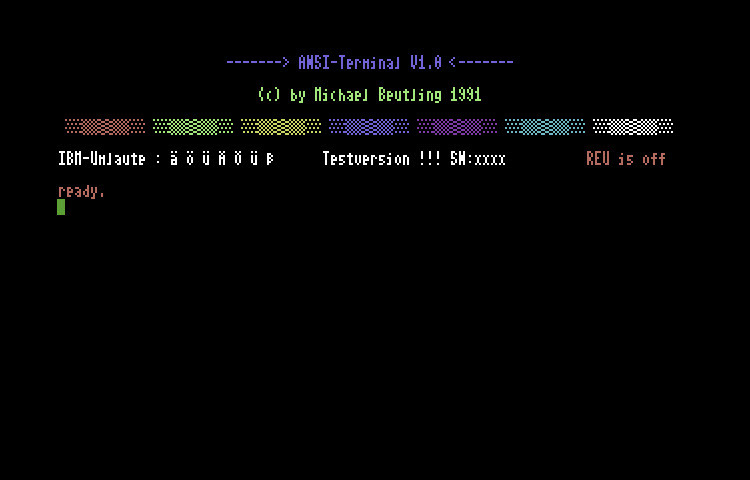 This appears to be a test vesion of an 80 column ANSI capable terminal program with possible REU support. There's a doc file on the disk but it's in German. Released Sept. 30, 1984 and originally written by Steve Punter for the PET. 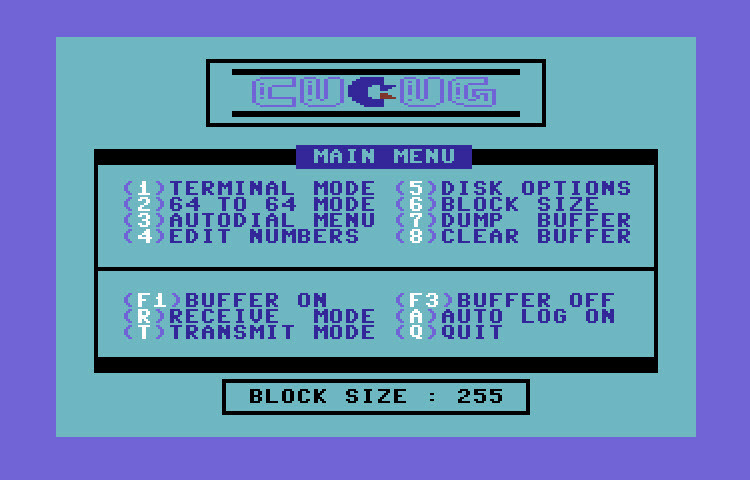 Converted to the C64 by Keith Peterson and enchanced by Earl Goldberge and Rich Buchanan. 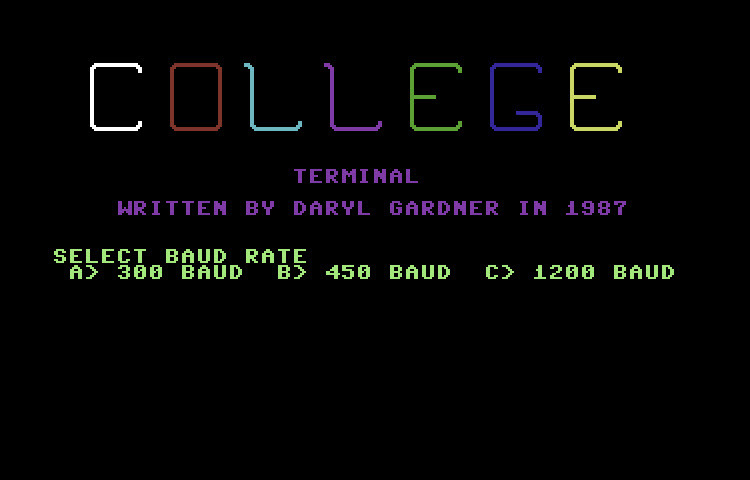 I don't know a whole lot about this terminal program. One thing I find interesting about it is that it supports both the older 7-bit Punter protocol and the newer 8-Bit version. Originally written by Steve Punter. Features the new 8 bit punter protocol. 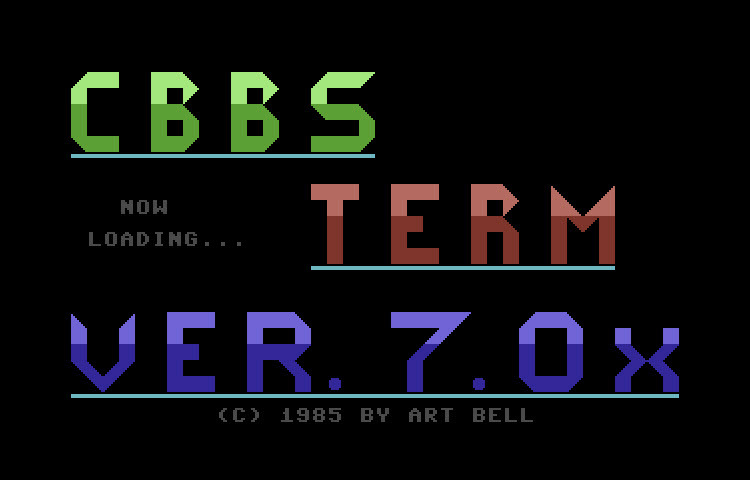 Who knew there was a 7 bit version? Released March 5th, 1985. Small docs file on disk. Haven't been able to glean to much info from the program but it supports Punter transfers and although mostly blitzed BASIC, there is some ML. Written by Bryan Poole (a.k.a. The Marvelous One). The reason for the name is because of a transfer protocol that allows sending and receiving at the same time. Supposedly there is also a Boomerang BBS. Released December 9, 1984 by John Watson. 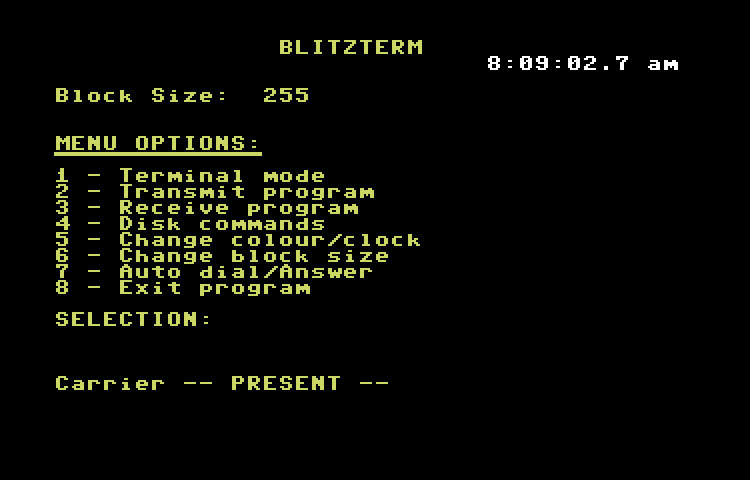 This is a term that allows you to logon to "Atari Only" board and check out their graphics mode. This is totally a modded version of CCGMS. Not exactly sure which version but this does have multi-send/receive. Mods by Lord Drone. 1986 - Art Bell. 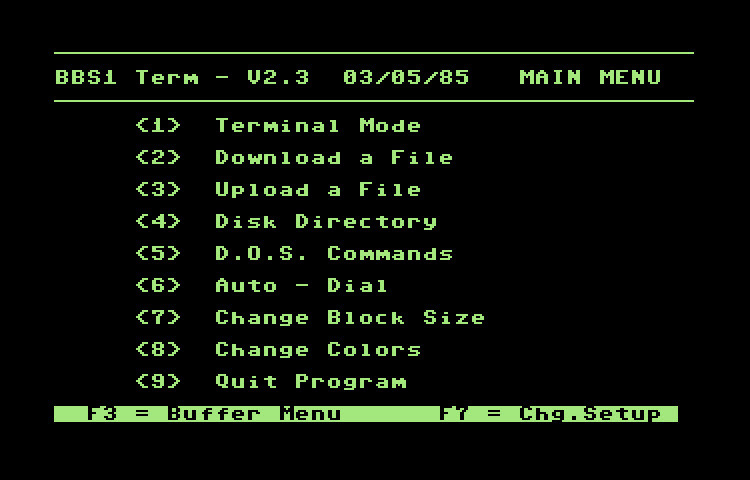 Nice looking terminal program. Supports Punter and two drives. Only 1200 baud though. Author - Julio Cesar, 1986 JCP Labs. 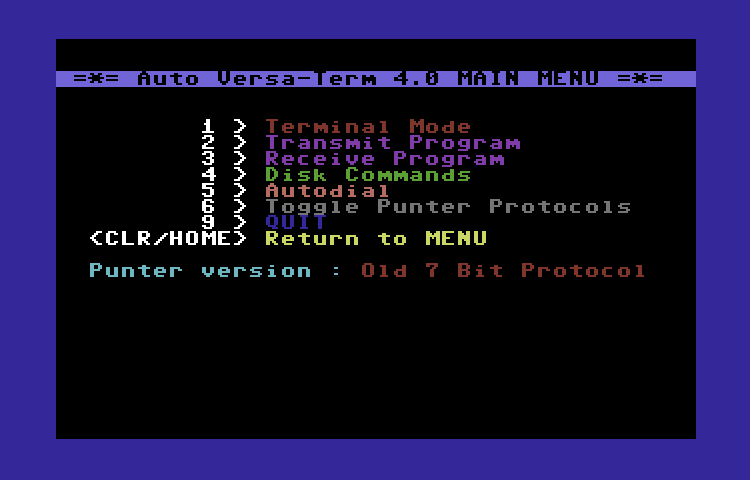 This is a full fledged terminal program with a HUGE buffer and punter protocol support. 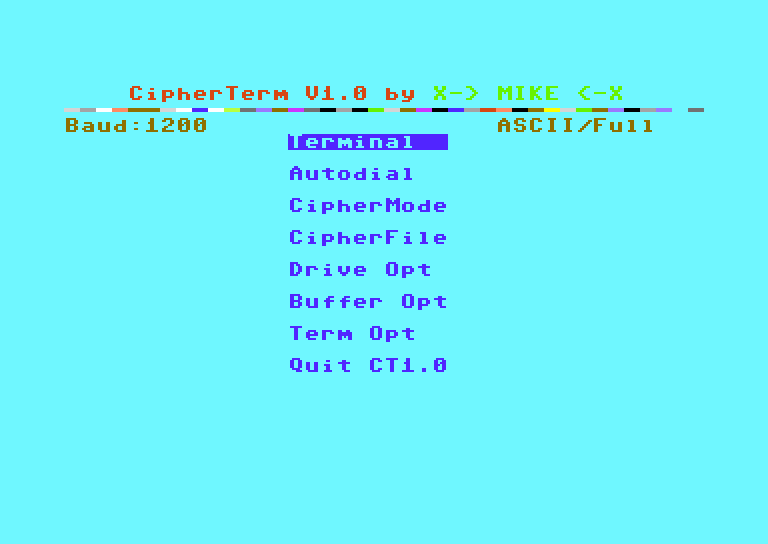 CipherTerm v1.0 by X-Mike-X released in 1990. 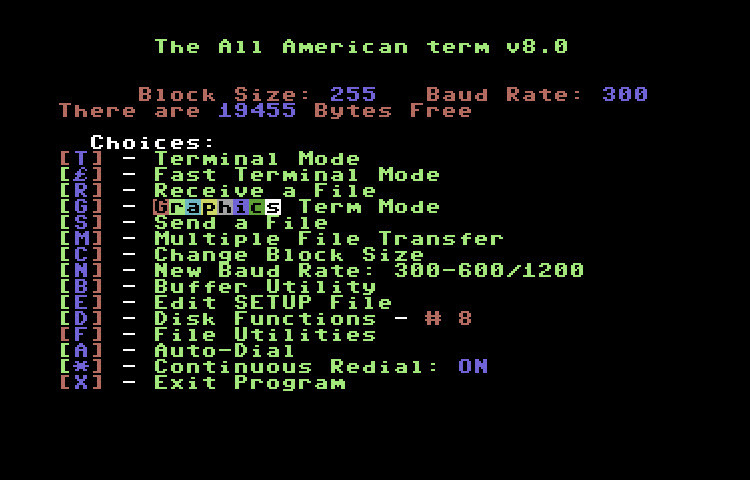 One of the interesting things about this terminal program is that it has a partial Z-Modem transfer implementation. There is a doc file on the disk that gives more detail. 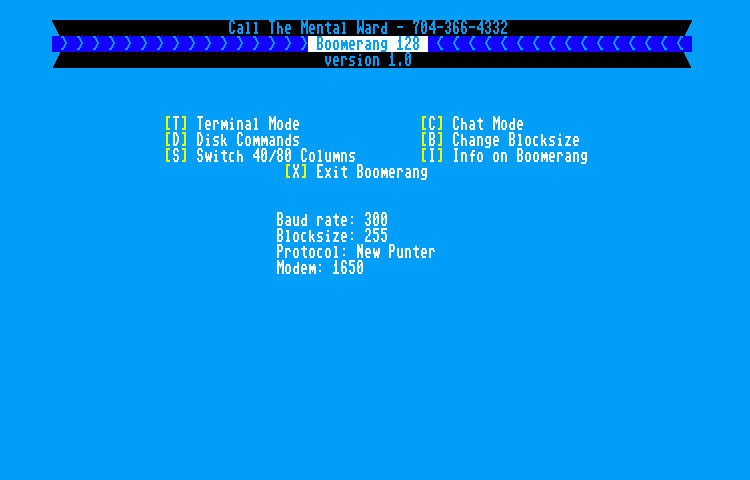 Note that the Z-Modem is receive only. Released in 1986 by Comptro. 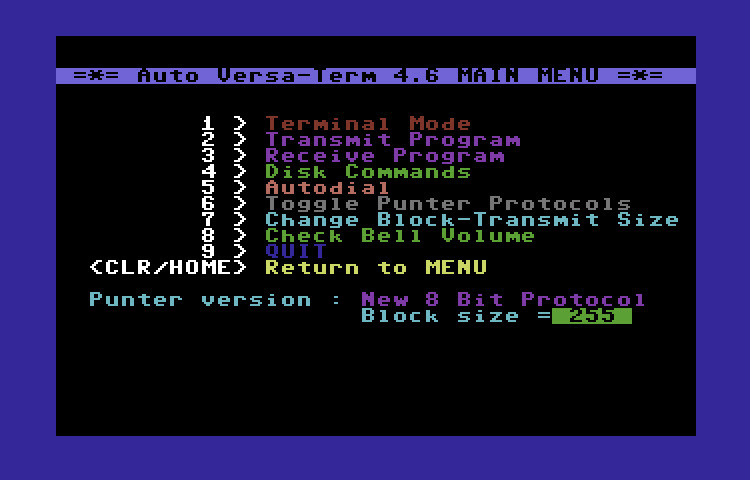 Nice terminal package with Punter transfers and buffer. 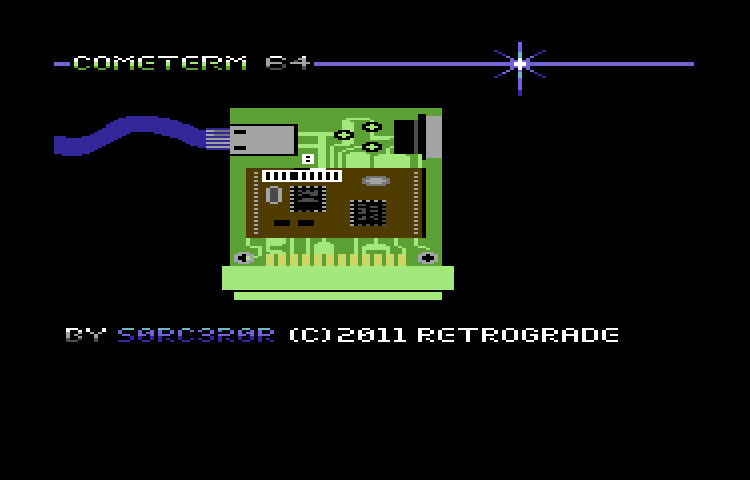 By S0RC3R0R (c) 2011 Retrograde - This term is specifically designed for the Comet hardware. 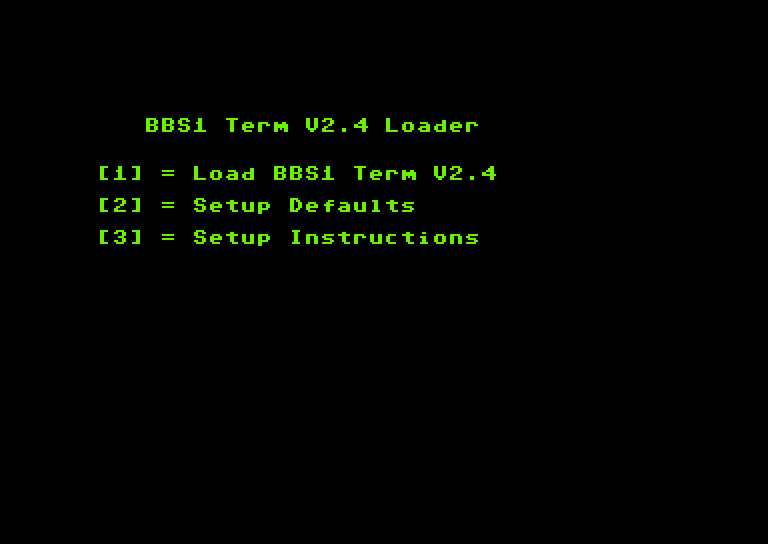 Supports 38.4k baud on the user port!!! It's a little rough around the edges but has tons of potential. 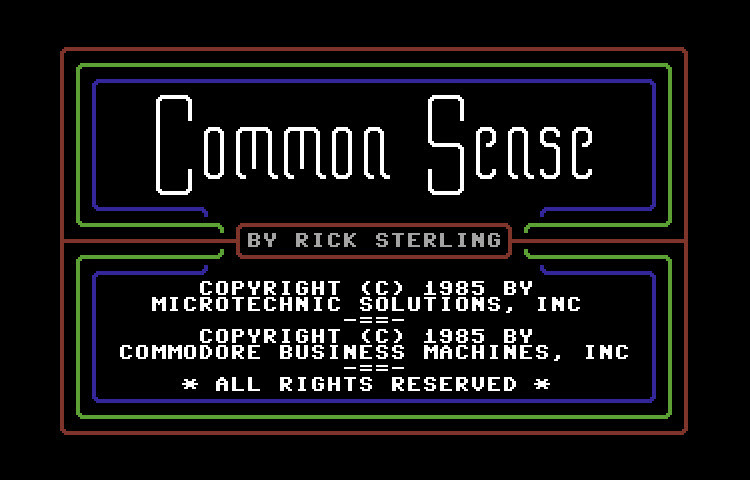 Written by Rick Sterling - Common Sense came with some Commodore 1670 modems. It has some buffer options and macro capabilities. 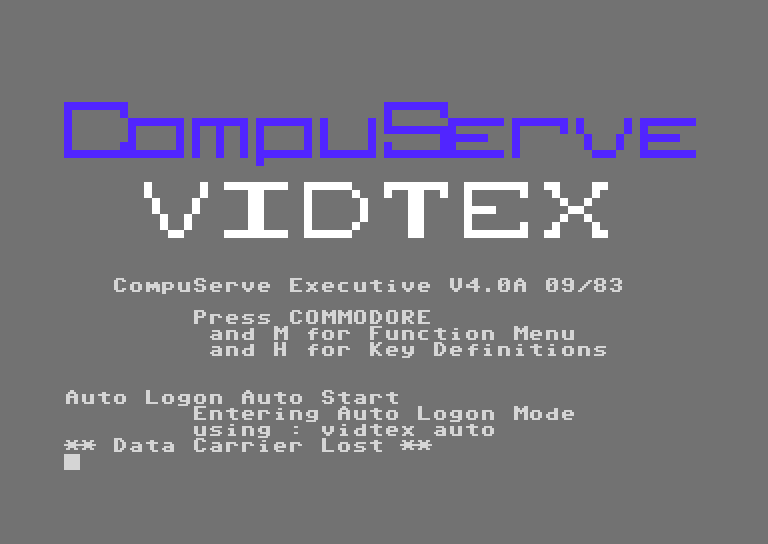 CompuServ Executive for the Commodore 64 is a terminal program for the long dead online service called CompuServ. No use for it at all these days, but we are all about history here, so what the heck. 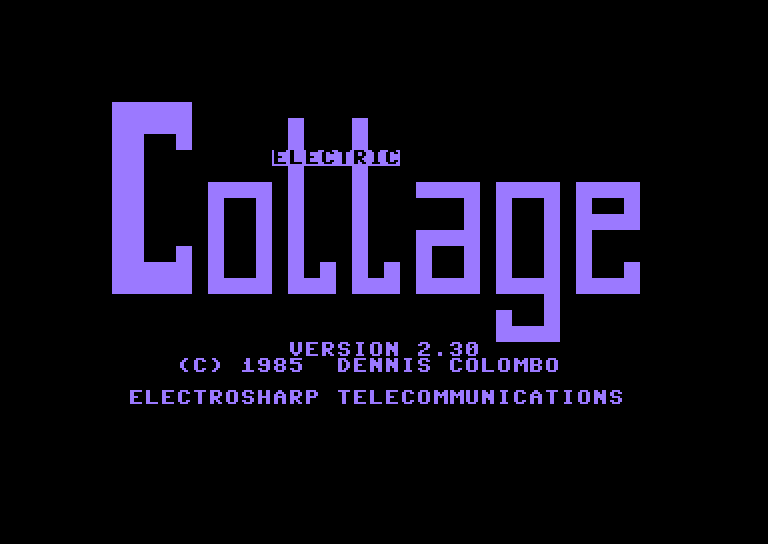 Cottage Term (Electric Cottage) v2.3, released in 1985 by Dennis Colombo of Electrosharp Telecommunications. 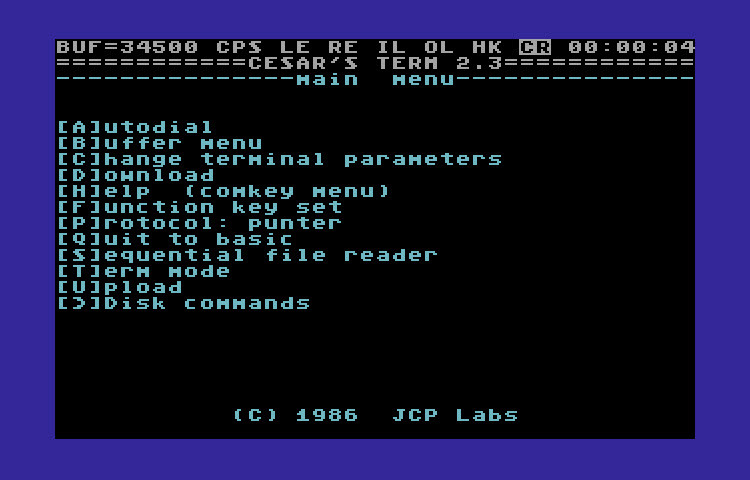 Pretty nice terminal program for its time (Commodore 1660 modem era). Note - you'll need to run the Unsqueeze program on the disk to extract the program and the docs. Stephane Laroche, 1988. 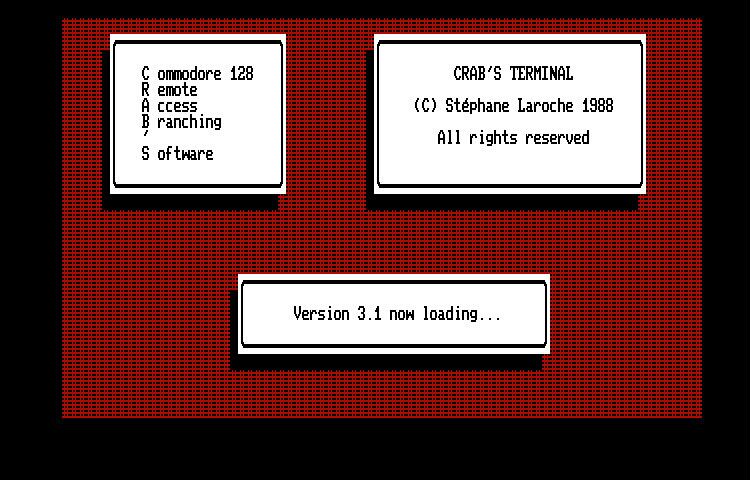 I wonder why a girl would want to name her terminal program "CRABS"???? Pretty nice term anyway. 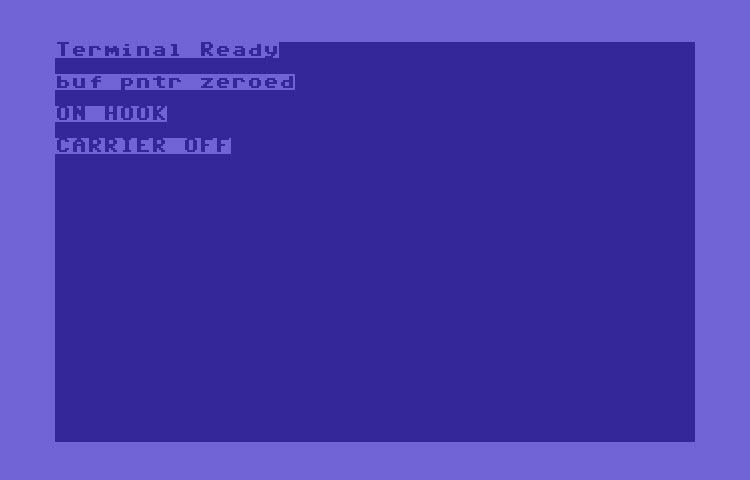 Supports ANSI, VT100 and some other odd emulations. 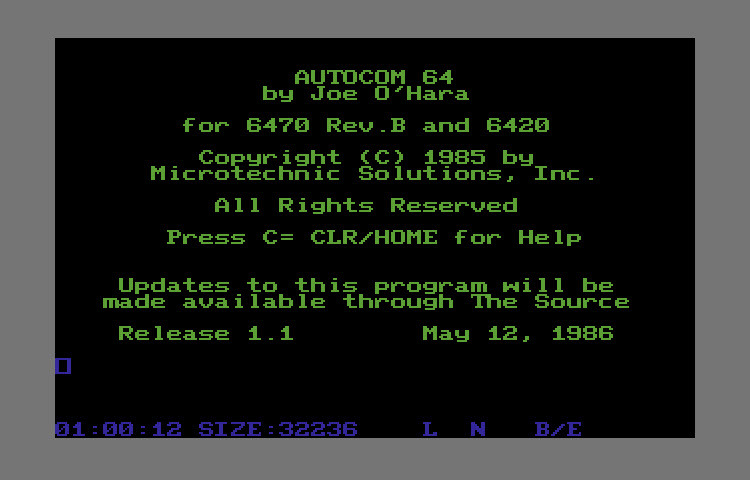 Champaign-Urbana Commodore Users Group Terminal is a nice C64 Term with autodial, buffer options, phonebook and file transfer support. 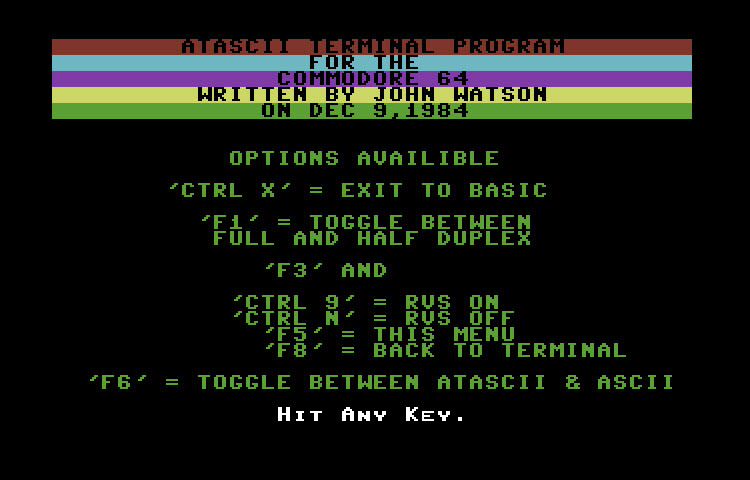 Software by Steve Scotland. This version was released on Sept. 11th, 1989. 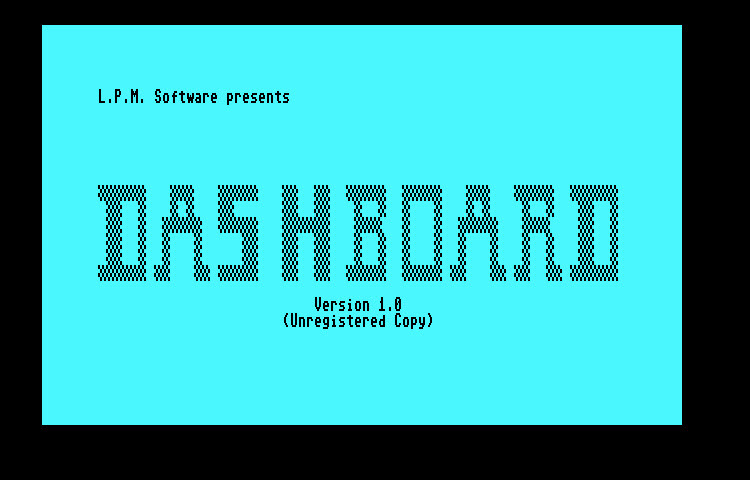 Dashboard is a very simple 80 column terminal program supporting 300/1200 baud and xmodem transfers. Docs are on the disk. Released in 1987, By Dawnstar Productions. Written by R'Korra'ti. 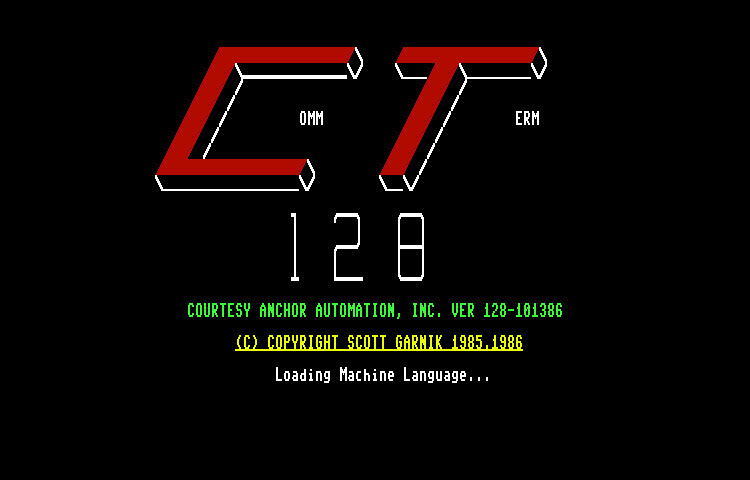 Features: 3/1200 Baud, ASCII/Petscii, ATASCII (Atari) Xmodem Transfers. Complete docs on disk.